In this section, I'll present regularly a tribute dedicated to a member of the 17th A/B Division. This week (August 15, 2011), I open the section by John S KNIGHT Jr.
John S KNIGHT Jr was native of Summit, OH. He was graduated from Culver Military Academy in June, 1942 and was commissioned a second lieutenant in the artillery. At Culver he was captain of the varsity cross-country, track team and boxing team. In March, 1943, he volunteered for Airborne and was transferred to Fort Benning. He trained as a liaison pilot at Fort Sill, Okla and was finally transferred at Camp Mackall, N. C. . 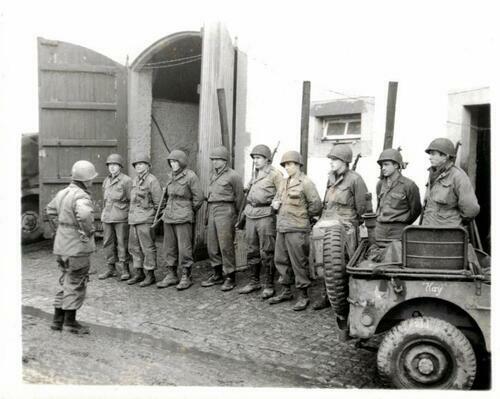 He was promoted First Lieutnant in December 1944 just before the Battle of the Bulge. Lieutenant Knight and the former Dorothy Elizabeth Wells of Columbus, Ga., were married Nov. 20, 1943.They had a boy in April 1945 called John S Knight III. First Lieut. John S. Knight, jr. has been awarded the Bronze Star Medal on February 7, 1945 for heroic and meritorious service in action against the enemy in Belgium. The citation for the medal came from Maj. Gen. W. M. Miley. The citation reads that "on Jan. 21, 1945, First Lieutenant Knight with a small reconnaissance patrol cleared the enemy from Hautbellain, Belgium. In the face of a numerically superior force, the patrol, under the aggressive leadership of Lieutenant Knight skillfully carried out its attack completely routing the enemy. The actions of Lieutenant Knight were in accordance with the highest standards of military service". Knight will be Killed In Action with three of his men during operation Varsity, while engaged in reconnaissance patrol near Hullern (Germany) on March 29,1945. The reconnaissance patrol was made up of four men and was two miles in front of the infantry lines when it was ambushed. The only surviving member was P.F.C. Earl Holcomb. 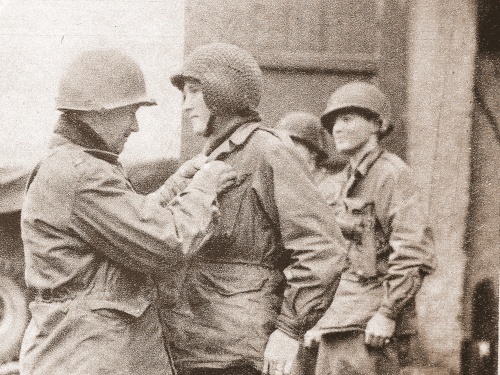 Siebenaler (Great Dutchy of Luxembourg) - General Miley decorates Lieutnant John S Knight Jr (Recon Platoon) with Bronze Star during the Battle of the Bulge, on February 7, 1945 while Division was still in Luxembourg. Note the very unusual used of a USAAF Flak helmet with net (TFH collection). FIRST LIEUT. JOHN S. KNIGHT, JR., son of the president and editor of the Beacon Journal, was killed March 29 with three enlisted men in a German ambush near Muenster. Dispatches from the front said the ambush occurred when Lieutenant Knight was leading a reconnaissance party of our men during the 17th airborne division's drive on the Westphalian capital. They were two miles in front of our infantry lines. Lieutenant Knight was 22. His wife, the former Dorothy Elizabeth Wells of Columbus, Ga., whom he married while in paratroop training at Fort Benning, Ga., became the mother of a son, John S. Knight III, two weeks after her husband died in action. The tragic news was withheld from publication so that no hint of it would reach the lieutenant's wife until after her baby was born. The only suriving member of the reconnaissance party was P.F.C. Earl Holcomb, 25, of Fola, W. Va. He gave an account of the ambush to newsmen, B. J. McQuaid, correspondent for the Chicago Daily News Foreign Service, reported from Muenster. John S. Knight Jr. (U.S. Army Serial Number 0-439199) and I, Walter S. Burr (U.S. Army Serial Number 0-439182) were friends and classmates at Indiana's Culver Military Academy from September of 1938 through June of 1942. Within days of our graduation from Culver, we were both commissioned as 18 year old U.S. Army 2nd Lieutenants at Fort Benjamin Harrison, Indiana. John's branch of service was Field Artillery, mine was Cavalry. John went to the 17th Airborne Division, and I was assigned to the 4th Armored Cavalry Regiment. Both of us fought with our units in Europe. On March 29, 1945,.I learned that John's and my units were within a few miles of one another. I borrowed a vehicle and, when I got within the 17th Airborne's sector, by repeatedly asking questions, I eventually learned exactly where he was. As I pulled up, I spotted him as one of 4 soldiers loading into a Jeep. I shouted, “John!” From the passenger seat, he turned, recognized me, and shouted back, “Wally! Goin' on a patrol. Can't talk. Catch ya later!” I waved, and with that, he and his colleague's were off down the road. John and all but one of his men were killed on that patrol. Both John and I were awarded Bronze Stars for our service. I ended the war as one of the few officers of the 4th Cavalry to survive without being wounded. Post war, I remained a reservist and later was called back into service during the Korean conflict, which I spent safe and sound at Fort Knox, Kentucky teaching tank gunnery. Have since enjoyed working in the entertainment business as a TV director. John S. Knight Jr. was probably one of the finest men I've ever known. As a cadet at Culver Military Academy he was a born leader and I'm certain the men he fought with were proud to have served with him. Had he lived, I'm sure John would have followed in his father's footsteps as a famed leader in America's newspaper publishing business. Thanks Mr Burr for your testimony ! To stay in the topic, this is another photo of Lt John S Knight Jr when he received his Bronze Star Medal from General Miley. The scene is located at Siebenaler, Great-Dutchy of Luxembourg on February 7, 1945. Lt Knight is the third man from the left. It is really interesting to note that he wears an USAAF flak helmet, a very unusual practice in the infantry or airborne troops. Once again, the men wear heterogeneous uniforms (M43 uniforms with or without reinforced trousers, M41 jacket with German belt, jump boots, overshoes arctic, M-1944 shoe pac, …). Note also the additional seat to the rear of the jeep on the right. 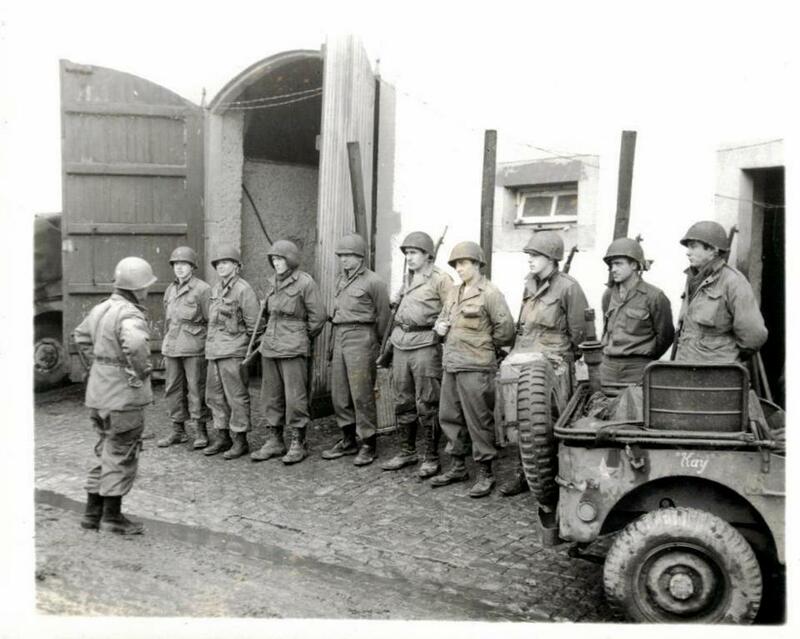 The man on the first row is Brigadier General William Miley, the Commanding Officer of the 17th Airborne Division. Click to enlarge (National Archives).